All 13 Quip coupon codes have been verified and tested today! So you’re ready to start giving your teeth the best possible treatment and you have a Quip coupon code? Rock on. It’s as simple as that. You’re now one step closer to a healthier smile. Sign up for emails and get in on health tips, the latest in technology, Quip product updates, a heads up on a Quip discount code, and so much more. Your inbox will never be cluttered and if you change your mind you can always unsubscribe. Email updates are the best way to make sure you are the first to know about sales and discounts. Follow Quip on Instagram, Twitter, and Facebook for tips, reviews, sleek photos, sale updates, frequently asked questions, technology innovation, and so much more. Social media is a great way to stay connected with your favorite brands and stay in the loop on the latest sales and products. Follow along at @getquip. So you don’t have a Quip promo code? No worries! You can still save simply by checking the website to see what deals and promotions are available. Quip will often run temporary promotions during holidays and sales events. Plus, you’ll get to see the latest news so be sure to check in often. Free shipping on auto-fill-no Quip coupon needed. Quip toothbrushes are effective and easy to use, but to ensure that you get the best use out of your toothbrush, make sure to refill the brush head every three months. Here’s the good news—Quip offers refills at just $5 for a new brush head with free shipping every time! That’s right, no Quip coupon necessary. Plus, you can even make sure to get anticavity mint toothpaste in your refills for the extra protection. It gets even better—you can sign up for an auto-refill plan so that you don’t have to worry about when it’s time to replace the old brushes. It makes life easier on you and it’s easy to set up. So you have a Quip toothbrush and you want everyone to know how amazing it is? As a Quip user, you get a $5 refill Quip coupon to share with a friend on their first refill! If that friend cashes in, you also receive a $5 refill Quip coupon that will be automatically applied to you account. Refer as many friends as you like and keep building up credit towards free brush heads. Plus, earn even more refill credits when you add family members to your account by providing their name to purchase a Quip toothbrush for them. Finally, you can even earn more refills by connecting your dentist on Quip. To learn how to get started with these awesome rewards, visit Quip and select “About>Rewards” from the main menu. 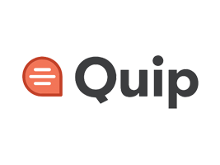 Quip offers free shipping (3-7 business days) to the contiguous U.S. for both 3 monthly refill plans and starter sets with subscription plans. Quip also offers priority shipping (2-3 days) for $5 and express shipping (1-2 days) for $15 if you need your toothbrush or refills sooner. That’s not all—Quip also guarantees a “covered for life” policy on toothbrushes that are on an active refill plan just in case anything happens. If you have a Quip brush that does not have a refill plan, you will still be covered for one year after your purchase. Finally, Quip also offers a 30-day risk-free trial period. This means you have 30 days to try out your new toothbrush and if for some reason you are not satisfied, you can return your Quip for a full refund. Please note: shipping costs will apply for refunds.